In Chicago there was this magical place called Homemade Pizza. You could get all sorts of fun and delicious toppings on a yummy thin crust – and then bake it at home! My favorite was the Georgia, Charlie’s was the Buffalo Chicken (gross). Anyway, since relocating to sunny California, I have been craving Homemade Pizza like crazy! I had never made a real home-made pizza before so I was kind of apprehensive about the dough/baking instrument/ingredients/toppings… everything. After all thirteen of our boxes showed up… (Yes – we packed our entire life into two cars and thirteen boxes) I found Charlie’s old pizza baking tray and felt inspired! I searched for pizza recipes and found this one on Real Simple. I changed some of the ingredients/steps… but it turned out AMAZING! Like Meryl Streep Amazing. Form pizza dough into a 12-inch circle on a floured surface. (Note: This is a pain in the biz-utt, make sure the dough is at room temperature – I had to use a rolling pin and a whole lot of perseverance). Place pizza form onto a baking sheet (with corn meal on the bottom) or pizza pan. Spread olive oil over crust – sprinkle salt and pepper. Break cream cheese into small pieces and place on oiled crust. Sprinkle 3/4 cup cheese over cream cheese and oil. 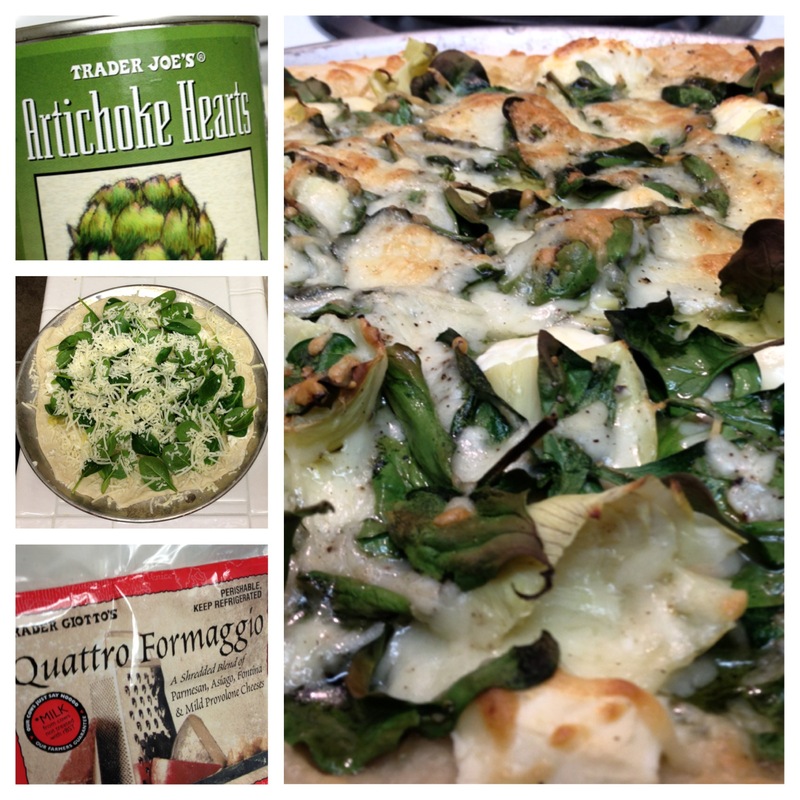 Quarter artichoke hearts and spread over pizza. Spreading the cream cheese over the pizza dough evenly before adding olive oil and other toppings!